If you follow my blog regularly you will be aware of my love towards skincare villa’s powder cleansers. My love for cleansing grain started when I got my hands on Skincare villa green tea and mint cleanser. Powder cleansers have helped with my oily skin issues. Whenever I use powder cleansers, my skin feels hydrated and fresh. Using powder cleansers helped a lot with my clogged pores issues. 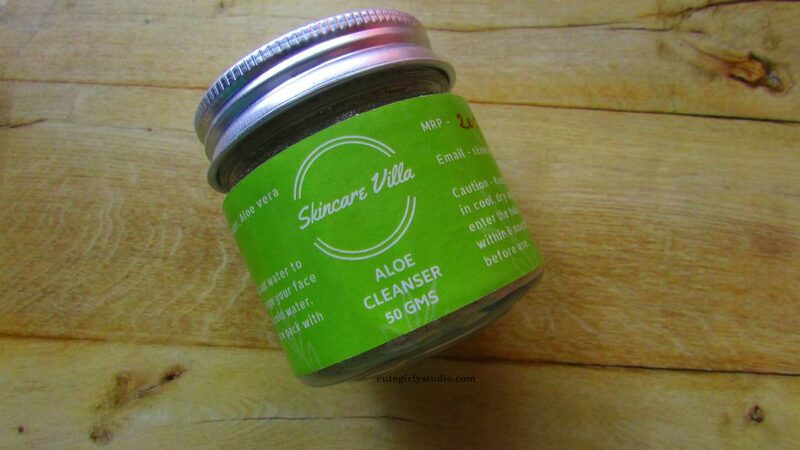 Aloe Cleanser is a new addition to skincare villa’s powder cleanser range. I have been using it continuously for a month now and here is my review. 200INR for 50gm. You can buy the cleanser from their Instagram page here. Oats, organic neem powder, aloe vera powder, cucumber powder. Owing to its saponin content, oats works as a terrific natural skin cleanser. Whether you have sensitive or dry ski, it doesn’t strip it natural oils. Oatmeal has rich anti-oxidant properties and helps undo damage done to your skin by pollution, UV rays and chemicals. 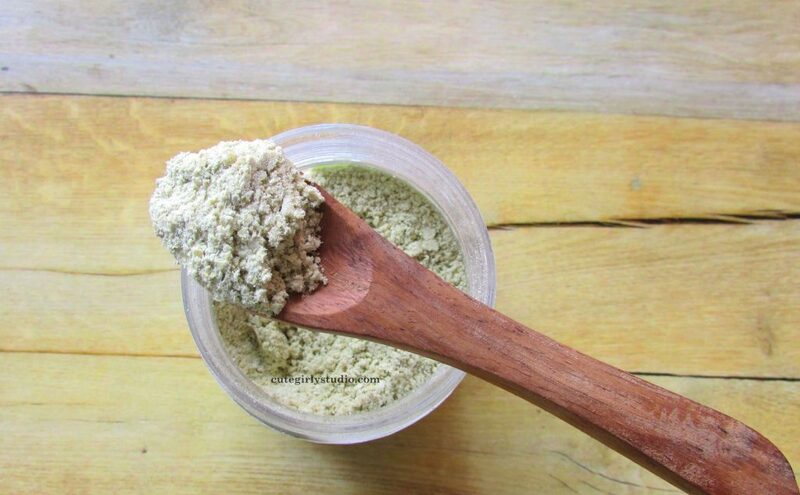 Using neem powder regularly in a skincare routine will help in clearing acne, scars, pigmentation and blackheads. With its regenerative properties, neem helps the skin fight pathogens below its surface. As a result, your skin remains supple. Its antibacterial, antiseptic and anti-inflammatory properties protect the skin from bacteria and other pathogens which lead to infection and inflammation. It contains substances – gibberellins and polysaccharides – that stimulate the growth of new cells, while glycoproteins reduce the inflammation and redness. As an astringent, Aloe Vera reduces pore size, which helps keep out excess sebum, dirt, and microbes. Cucumbers are loaded with lots of nutrients like potassium, vitamins A and C that soothe skin conditions like sunburns. The astringent property of cucumber tightens pores and regulates sebum production. The aloe cleanser comes in a sturdy plastic jar. The container is sturdy and travel friendly. The skincare villa aloe cleanser is pale green in colour and smells like a mixture of neem and cucumber. The texture of the cleanser is soft and smooth. As soon as I mix the cleanser with some warm water, it turns into mushy soft cleanser. The cleanser is extremely smooth that even sensitive skinned beauties can use this on a regular basis. As soon as I rinse my face, my skin feels soft and hydrated. Thanks to the cucumber and aloe vera. With the addition of neem powder, the cleanser helps to prevent acne and blackheads. I started using this cleanser when my skin behaved normal to combination, at that time it cleansed my skin without leaving greasy. Now with the increase in humidity, my skin turns super oily and whenever I use this cleanser my skin remains little oily, so it is a must to wash our face twice with this cleanser to remove all excess sebum. Though I wash my face twice with the cleanser, my skin doesn’t feel stretchy. In fact, my skin feels hydrated. Overall I love this cleanser. If you have super oily skin, then you might want to wash your face twice in order to remove excess oil. Yes. It’s a great hydrating cleanser.